If my battery is dead and the doors and trunk are locked, how do I get into the car? Thread: If my battery is dead and the doors and trunk are locked, how do I get into the car? Many members have posted with this problem and the complete solution has finally been presented by Qsilver7 and cnn. If you're battery is dead and your doors are locked, first try this method to gain access to the interior and the battery (which is in the trunk) for jumping. Owners unfamiliar with how to unlock their cars in the event of an electrical failure has plagued every BMW forum I've ever been on...going back to my first BMW...a 1985 e30 325e. In each case 99% of the time it is OPERATOR ERROR. First, most asking the question either missed it, forgot it, or never read the info in their owners manual...then when told what to do...they many times fail to turn the key far enough counter clockwise to the manual unlock position. This is the manual unlock position for the driver's door (as an example that the lock DOES turn that far)....if your's don't, then when was the last time you lubricated your locks? 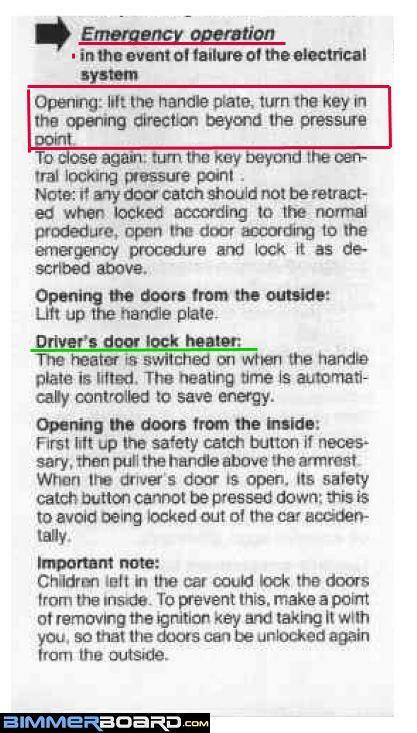 BTW...the same goes for the trunk lock cylinder on the e39 sedan (the e39 Touring does not have an external lock cylinder...but the tail gate can be opened manually from inside...see your owners manual for instruction). If you (like many other E39 owners) can't get the doors/trunk to unlock manually, try this method which provides power to the car externally and allows the doors to be unlocked via the key fob. Jack up the driver's side front wheel and support with jackstand for safety reason. There is a red cable going to the starter motor. You can jump through that (+) post labeled "Red Positive Cable" and a ground (such as Transmission). PM me for Interior Trim Wraps!!! Get rid of your old wood! Jamesdc4 - very, very "Q"ish (& that's a very good thing)! Very good explanation for a very common problem people run into. James, Cam and others,this is excellent information here and i know it will prove to be a gem for many to come. I feel it should also be stressed that we ideally should jump start from the battery terminal in the engine compartment, not the battery. Directly from the battery has been known to create electrical issues. My method is basically the "last-line-of-defense" one. - As QSilver7 said, one should be able to open door and trunk manually (even with dead battery). - However, I have seen this in different forums that some people are locked out when the battery is dead, and they cannot open the door or trunk manually even with some force. 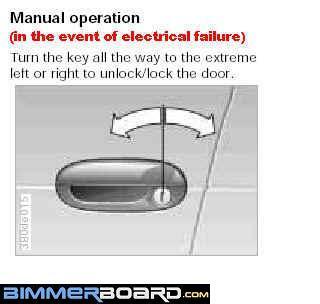 Does anyone know the exact mechanism of the manual mode failure: i.e., exactly what part in the lock actuator goes wrong that prevent people from opening their door/trunk manually? Any door actuator expert here? Back to this trick of jumping the "Red Positive Post" when you are desperate, I just confirmed with my 1998 528i (and probably true for all I6 models, and maybe V8 too) that there is no need to remove any plastic shield to get to it. 1. Make a note of the Rear part of the tire (the driver's side front tire). The "Red Positive Post" is directly inward of the Rear part of the tire. Laying on your back and reach your hand in and you will see it (a large makeup $5 mirror will be very useful). - Place a jackstand under the subframe. This is very important if you don't want to be crushed! - Then do the jumping of (+) and (-) terminals as mentioned previously. On some of the cars, the trick of using the manual keys and tickling the door handle will pop the lock open, but this is not always reliable, and sometimes just simply doesn't work well. While it requires a certain "touch", and if you've never done it, it may not be easy, even when you know what you're doing, it can "fail". I used to have this periodically on my E34 M5, and found a workaround to get into the car's front door by the following means. Manually open the trunk by key. This never failed, even with dead battery. Then the front could be opened, then the trunk, then the ardous process of jump starting could begin. Sealbeach: OMG... "Q'ish"... I've now achieved adjective status! Thanks, I'm humbled ...that made my day...I've been "verbed" before (Q'd) but I think this is the first time being an adjective. Last edited by Qsilver7; 06-03-2016 at 06:19 PM. Glad my incompetance has helped others, lol. Seriously though, you guys are life savers. I thought the Official BMW diagnostic procedure requires the summoning of no less than One (1) Magical Wizard. You still have not explained to the group why you cannot open your door manually....LOL. 1. Lower the driver's window so you reach inside. 3. Reach inside and hit trunk release; open the trunk and d/c battery ground cable. Now try to open your door manually, can you open it manually? (The reason for #1 above is in case you cannot open the door manually, the window is down so you can still get inside the car). For those who follow QSilver7's instructions to the "t" and still cannot open the door manually, this is my theory. It was 10F and I parked the car outside and used my manual key, it was stiff to turn to -45 deg position (see post #5 above) to open the door. 1- If you always use your remote, then your cylinder lock never goes through the "daily workout". 2- Now add water from rain, car wash, freezing rain over a 10-year period. 3- Now add the fact that you fail to lubricate your lock cylinder with the appropriate graphite lubricant. When you look at all 3 factors above, 10 years later, when your battery is dead, there is a chance that your lock cylinder is seized (rusted in) and you can't open it manually. - Once a month, give the lock cylinder a "workout": open it manually. This way when you face with emergency, you are not caught by surprise! Last edited by cnn; 01-03-2011 at 10:27 AM. If the trunk is open, why not just jump the battery directly? I agree with ElleShooTiger, once the trunk is open, the battery is accessible. I think it might be a better idea to just use this method to get power to the car to open the doors. Then I would pop the hood and jump from the proper terminals in the engine bay. As mentioned earlier in the thread, bad things can possibly happen jumping from anywhere other than under the hood. CNN, i greased the lock, works fine now. I couldn't get my lock past the 45 deg mark. Keep working on it (to go past -45 deg mark). Spray WD-40 etc. The key thing is to get to -90 deg! Eventually, you should be able to get past the -45 deg mark. Last edited by cnn; 01-03-2011 at 12:44 PM. Cam forgot to add he's not responsible if you break your key in two. Once again the "board" sheds a better light , and in finding this post another question was answered , it has been several months since tearing down the top end of my daughters car in the process of a h/g - turned into cracked cylinders (2) and now I am almost ready to install the new engine . Could not remember what the brass bolt on top of the i/m was till seeing the pics. Thanks for the tips. In my case, I have a 2002 525ita sports wagon and the key solution did not work (I only had a +45 and -45 movement regardless of lubrication or not. Also, you can only use the key from the drivers side as there is no hatch key. The trick for me was to do what CNN had showed and jacked/braced the car on the drivers side and jump the car from the starter. The only issue with CNNs note was that with a decent pair of jumpers, you will have to take the red shield off the bolt to jump the car. However, the cover is only snapped in place and is easily removable once you are under the car and it provides full access for the jumper contact. After you jump the car, you can snap the cover back in place. Worked like a champ. Thanks guys!! i accidently locked my manual key in back of the trunk of a 745li and the battery was disconnected how do i get to trunk ? any suggestion would help! Just wanted to write and chime in with an almost - similar situation. No real new info but just wanted to re-iterate what worked. 1. Battery went bad. Warnings. 2. Decided to change battery. 5. No way to open trunk without battery. 6. LUCKILY door was open. 8. Went to store and bought new battery. 9. Connected new battery to jump start terminal. 10. Used remote to open trunk. Completed battery install.